Built around 1880 by John C. Thomas, he learned to be a saddle maker from his uncle. He partnered with his two brothers forming the Thomas Brothers Hardware and Saddlery which was located on the corner of Union and Main Street in Hartford. He lived there with his wife and son. 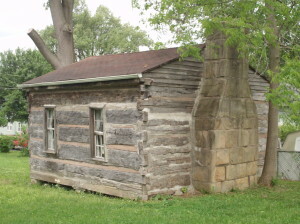 Parks Log Cabin was built in the 1838. The Parks Log Cabin was constructed in 1838 by David Parks. 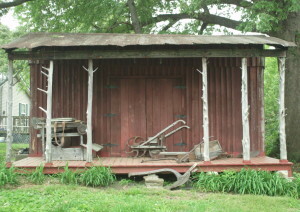 It was located in the Horse Branch area and was moved to the property in 1976. Some of the logs are 22 inches wide and it used to have a loft where the children slept. 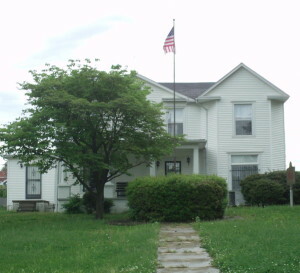 The chimney is not original to the building; it was constructed from stones from Revolutionary War soldier Jesse Ashby’s cabin chimney and stones from the retaining wall of the second county courthouse built in 1813-1815. It is furnished with period antiques. 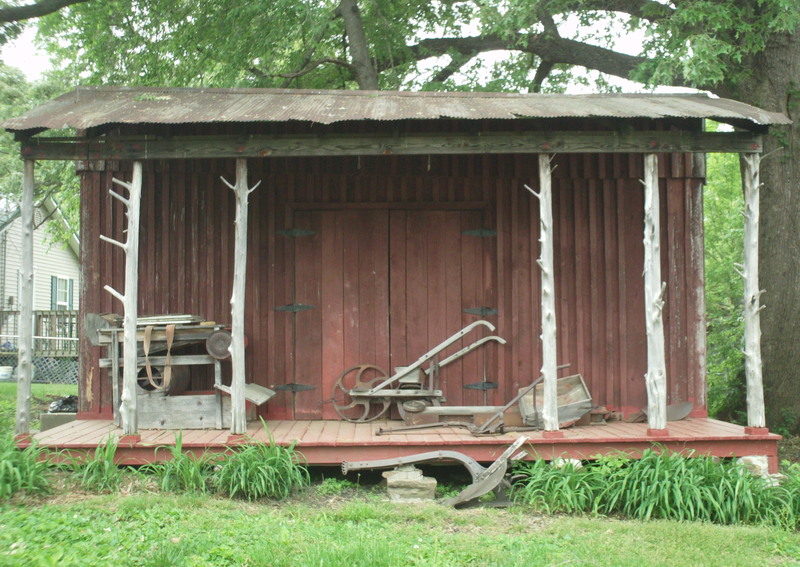 This building contains old farm equipment, tools, and even a rattlesnake! (Don’t worry, he’s stuffed.) You can see everything from a loom to Native American artifacts in here. This one room school came from the Goshen area. It was disassembled and reassembled on our property and dedicated in 1996. Come see what education was like in the 1800s. 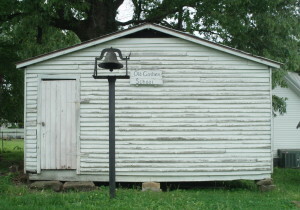 We may even let you ring the bell! 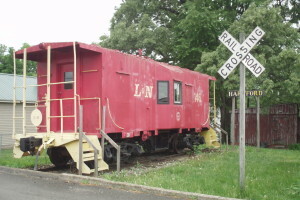 The L&N Caboose even has a mail hook to grab mail bags as it passes by. CSX donated this wonderful caboose in 1995. A conductor and brakeman used to ride in these special cars. The conductor did paperwork and the brakeman threw the switches. See what riding the rails would have been like. 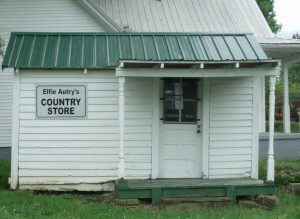 This tiny one room store was located on Clay Street in Hartford. Check out the products that would have been sold here. The house I grew up in was labeled and taken apart then moved. I thought it was taken by the historical society. My parents were Jessie and Vera Maze. We lived on Sanderfurs Crossing Road in Beaver Dam. It was taken down in the mid 70s. Do you know anything about this? I am currently researching your question and hope to have an answer soon. As soon as I can talk to a couple more people I will post all the information that I have found. Thank you for checking out the web page! After doing some research and speaking with members of the Historical Society, we believe that it wasn’t the Historical Society that moved the log cabin. There isn’t anything in our records and our members don’t remember anything about it. However, we believe that it was taken to the Fairgrounds and put up at the Fort. I was told Earl Russell was probably in charge of that but he has since passed away. His widow is still alive in Hartford as far as we know. You could try calling the Judge Executive’s office to see if they have any information on it. Eddie Hendricks was another name that popped up in discussions who might know about it. I haven’t been to the Fort in years, so I can’t say for sure that it’s there and when I called the office at the Fairgrounds they weren’t positive either. One of our members is pretty positive though that it is in the center of the Fort and is in good shape still. I hope this helps. The building associated with 235 South Main is an interest. Do you have any idea when the building was constructed and if there was any tragedy associated with the building any time in the past? Not off hand. If you look through the property records that would give some names to go by. That would help some. I don’t think we have any documentation. Have you checked the Special Collections library at WKU or any other university? Perhaps a reader will see this and have a better answer for you. I’m sorry, but we don’t have the ability to help in restoring old houses. I wish we did, there aren’t too many left in Ohio County. Good luck!